I don't want to get sentimental, but reflection often gives that glow. The last year has been one of lessons. It has seen friends come and go, it has seen loss in ways I never wished to see it, it has seen hurricane waves and sunshine mornings and everything in between. I don't know what the point of it all was, or if there was one at all, but I do know one thing: I'm grateful to have been here for it. I talk about mental illness a lot on this blog because it is something I live with every day. It clings to my shoulders, looms behind me like a shadow, waits around every corner. It's something that made me think, once upon a time, that I wouldn't be around to see 23, or 24, or 25 - or, perhaps worse, that I shouldn't. And while I can't say that I've slain this metaphorical dragon quite yet, and while I can't guarantee that I ever will, I have grown in spite of it. I've chained it down and forced it to watch me bloom in the light it tried so hard to hide from me. My upcoming book, Fictitious, is linked to these struggles in a deep way. It talks about fiction - about characters, about stories, about adventures had in books or on the big screen. It talks about the things that saved me - or rather, the things that gave me the strength to save myself. I've been thinking a lot about this, and about how I can use the book to do some good for mental health awareness and mental illness support. 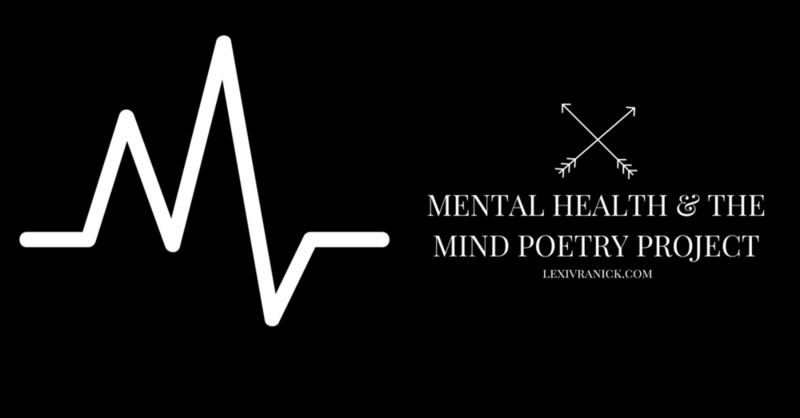 Earlier this year, I was grateful to be a part of the The Mind Poetry Project Please Hear What I'm Not Saying, an anthology compiled and published by Isabelle Kenyon to raise funds for the UK-based mental health charity Mind. Isabelle was kind enough then to allow me to use my piece in the anthology to raise some money for a similar organization in my own country: the American Foundation for Suicide Prevention. I'd like to do something like that again. Each year, I like to offer a discount on my books during my birthday month. 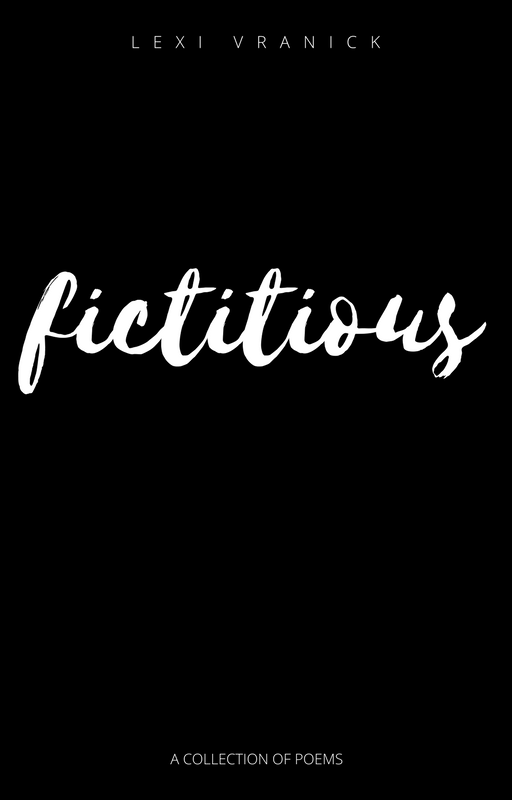 This year that discount will be on pre-orders of Fictitious. In addition, all funds from pre-orders will be donated to the American Foundation for Suicide Prevention in honor of their annual Out of the Darkness community walks. Please use the code AUG18 on your pre-order of Fictitious for 40% off your purchase! Your money will go straight to the American Foundation for Suicide Prevention to support their ongoing research, education programs, and survivor support. Each pre-ordered book will be signed and will come with a personalized thank-you note from me. Thank you all so much for all of your love and support over the last year. I'm incredibly grateful, and cannot wait to see what 25 has in store. A few years ago, I signed up for a college creative writing course. I didn't know what to expect. I had been out of school for a year, having taken time off to manage my mental health. When I considered returning to the classroom it was my mom who suggested that I take something I was genuinely interested in- forget the gen eds, forget the major courses. Just dip a toe into something familiar. I browsed the course catalog and found a Sunday morning creative writing class. I registered. On the first day of class, the professor handed out a list of writing prompts. These prompts weren't like any I'd been given before. They weren't first lines, or settings for stories, or a challenge to write a poem with five obscure words that should never fit together. These were deeper. They were more intimate. They were letters to people who hurt us and admissions of high school embarrassments; they were designed to dredge up the darkest things inside of us and make us splatter-paint them on the page. Each week, the professor would assign one of the prompts, and we would spend an hour responding to it. Then, it would be time to share. Now, this professor didn't put anybody on the spot. All sharing was done voluntarily. If you didn't want to read aloud, you didn't have to. But he did want someone to read. And in that first class, no one seemed to want to. The personal nature of the topics didn't help anyone's first-class, public speaking jitters. We sat in silence after the professor's invitation to share. Everyone stared at their desks, fidgeted with their pens. We all avoided the professor's gaze. And that's when he said something that's stuck with me ever since. He folded his hands on his desk and he said, "What you write doesn't have to be great." We looked up, wary of what would come next, and the professor went on to tell us that we weren't here to write the next great American classic. We weren't here to turn ourselves into NYT Bestsellers. We were here to hone our craft. We were here to practice, and to learn, and to grow. He told us that he understood that we were nervous to share, and that those nerves were good. It meant that we had created something real. We had written something authentic, and if our writing should be anything, it should be authentic. Our writing should be our blood, our tears, our breath. It should be us. I went home with those words ringing in my head. The next week, when I went to class, I volunteered to read. And I volunteered every week after that. My classmates did, too, to the point were class would run an extra ten minutes just to squeeze everyone in. We spilled our hearts to each other, reliving our best and worst moments with a room full of strangers. From the trans girl who wrote stand-up routines about coming out to her family, to the girl who grew up in foster care and the boy who was kicked out of his house at seventeen; the eighteen year old who hadn't picked their major yet, thirty year old who was still finding herself, the girl who was abused by her mother, and everyone in between. We talked about the crushes we had in second grade and the scariest moments of our lives. We weren't trying to impress each other. We didn't need to. We were being authentic, being ourselves, and it was incredible. It was liberating. I've kept that thought in the back of my head. It fueled my first book, and then my second. This isn't to say that authenticity was ever missing from my writing. This has been my outlet for such a long time, my means of release, that it wouldn't be possible not to let my own thoughts and feelings spill through the cracks. But after that class, I broke those cracks wide open. I poured everything I am and everything that I had into them. 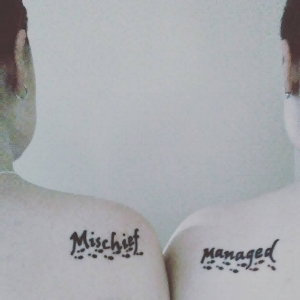 I made art out of them. Because I'm not here to impress anyone. I don't exist to wow other people. I exist to be myself. I exist to share myself. And ever since I embraced that - ever since this professor encouraged an entire room of young writers to embrace that - I've felt myself improve. Not in drastic leaps, but in small ways. In my manipulation of language and use of symbols. Everything has more meaning, because every last thing is rooted to something inside of me. I have been trying to bring this into other areas of my life. Into my conversations. Into my actions. I am trying to break out of the shell I've crafted bit by bit. To be true to myself. To honor myself. Because authenticity is the most powerful thing I have to offer. I am the most powerful thing I have to give. It feels like April has barely begun, but just like that National Poetry Month 2018 is over. The month did not turn out exactly the way I expected. Between mental health and home renovations, I've hardly found a place to plant my feet on the ground. I feel like all I've been doing is going through the motions - constantly, endlessly, in looping repetition. And while the month didn't go quite as I had hoped, it was still a great one. Exciting things happened, and mundane things happened, and inspiring things happened. All in all, while I might not have written as much poetry throughout the month as I had wanted to, I feel like I'm walking away from this celebratory month refreshed and truly ready to take on whatever might come next. To touch on the exciting things that happened this month: on April 5, I was interviewed by the always lovely Amber of YA Indulgences as part of her month-long Poetic Justice series and on April 15, my poem "White Knuckles and Broken Cars" was published in Issue 2 of Cagibi Lit. This marks both my first interview, and my first piece published in a literary journal! Moving forward, I've mapped out a plan to catch up on and continue the Year in Poetry series. You will be seeing frequent poetry posts over the next couple of weeks until we find ourselves all caught up and back in the groove. I'm very excited to get back on this particular horse, as the project is something I'm very determined to completed and absolutely thrilled to share with you. I've also pushed back the release date of Fictitious to allow more time to work out a few technical kinks and to ensure that this little book is the absolutely best in can be. 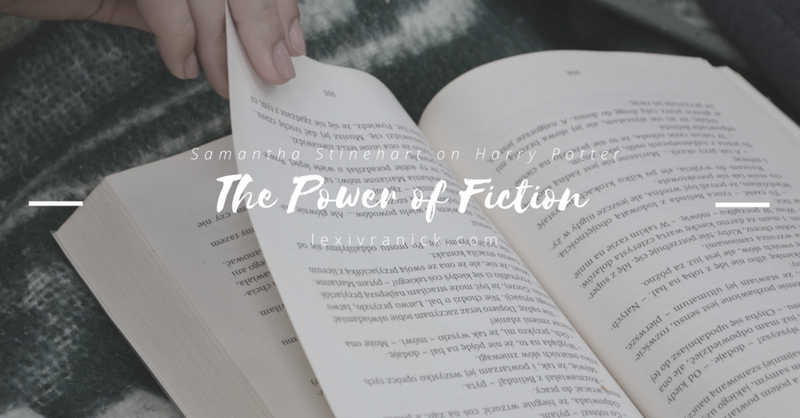 I touched on this in a bit more depth in the latest Power of Fiction guest post, so be sure to check that out! 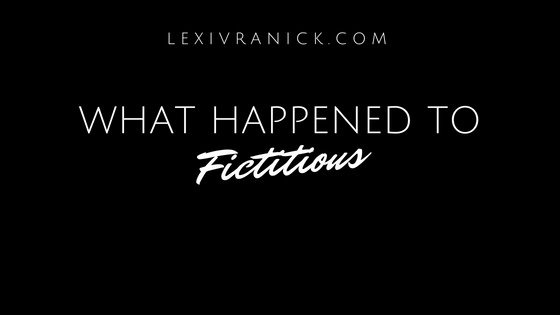 The new release date for Fictitious will be May 15, 2018. Over the past month, I have reached from a deep emotional low into something of a creative revival. Seeing other poets posting content throughout the month, being able to read and absorbed their words, has invigorated me. I have a lot of plans for the rest of this year, and some exciting announcements to throw at you over the next couple of weeks. One last thing: Ready Aim Fire is currently on sale in honor of National Poetry Month, and today is the LAST DAY to get it at this special reduced price! I hope this month and the poetry it birthed as sparked in you hope, and courage, and empowerment - I hope that it has shown you the world through a new lens, and that you walk away from it feeling greater, and bigger, and stronger. Wishing you all the best on this last day of National Poetry Month 2018! I'm so very grateful to be on this ride with you. I've been absent lately. Absent from this blog, from social media; absent from this whole writer's networking game. And while I have touched on the reason why in a recent Twitter thread, I wanted to talk a moment to talk about it here as well. From previous posts, many of you may already know that I've struggled with major depressive disorder and generalized anxiety disorder since 2011. I was formally diagnosed in 2014, when I was prescribed medication and began talk therapy. I have continued to manage my symptoms through these means, and began to feel stable around 2016. In 2017, I cut my therapy sessions down to every other week, then as-needed, then stopped all together. I was doing well. Really, really well. And then...I wasn't. We often expect mental illness recovery to be linear. We want it to be linear. And why wouldn't we? A straight shot from the worst feeling you can imagine to being happier than you've ever felt is ideal, no matter how long it takes to draw that line. When you start to feel like yourself again, when you have the energy to do the things you love again after months or years in a fog, you think you're in the clear. You should be out of the woods, right? You feel better, so you should be better. Mental illness doesn't work like that. Recovery looks more like rolling hills than one straight line. You hit some peaks, and you slide down into some valleys. And over the last couple of months, I've been deep in one of those valleys. What started as a couple of bad days turned into a few bad weeks, and now it's been over a month and I feel like I'm stuck on a plateau. Nothing in front. Nothing behind. Just flat, and empty, and endless. I've had to force myself to do the most basic of tasks. I've felt overwhelmed by things that usually excite me. I've been irritable and exhausted. It's frustrating on a lot of levels. I was so proud of myself, and I felt like people around me were proud, for doing well for such a long time. I graduated college in December, I'm preparing for the LSAT in June, I've published three books with a forth on the way. Everything is going well! So why am I suddenly so unhappy again? Why do I suddenly feel something so akin to what was my lowest low? It makes me want to burrow into the ground and never come back out. But I won't. Recovery may not be linear, but the rolling hills it makes get smaller as you go. That's something I've learned over the five years I've been in treatment. It doesn't get easier, per say, but it does get more manageable. You learn coping mechanisms, and you figure out what to do. I've taken steps to get out of this rut that would have been impossible for me to take or even think about five years ago, or four years ago, or even just two years ago. I've pushed myself out of my comfort zone and started going volunteer work. I tried out a new gym. I've started going to more formal yoga classes, and I scheduled an appointment with a brand new therapist. These things aren't easy to do by any means, and I've had more anxiety attacks than I can count over each and every one, but I know that they'll be worth it in the long haul. They'll help get me where I need to be. They'll help get me up to the next peak, and when I get there I'll have even more experience and skills to tackle the next valley with, too. That's the reality of recovery. Absolutely none of it is easy. Absolutely none of it is simple. It's hard work, and it's every day, and it's draining and frustrating and full of twists and turns you never asked to take. But each time you push through something hard, you're equipped to handle the next step. The valleys get shorter, and the peaks last longer. You get stronger. It may not feel like it - I certainly don't feel strong right now - but it happens with time, and with patience, and with perseverance. As part of it all, I'm working to get back on track with this blog and with my social media. Networking with the writing and reading community is something I genuinely enjoy, and something I'm eager to take back after spending this time feeling bogged down and scared. I want to thank you all for your patience with me. I'm eager and excited to create some fresh new content for you. If you have any questions about my experience with mental illness and recovery, please feel free to reach out at lexivranick.com/contact. I'm happy to chat with you. Please note that I am not a mental health professional and can only speak from my personal experiences. If you are struggling with mental illness, please know that you are not alone. If you do not feel that you can speak to someone close to you, know that there are hotlines available by phone, text, and online. Once upon a time, my mental illnesses were thought personality flaws. Depression was sadness, and sometimes laziness, and sometimes lack of sleep. Anxiety was a combination of student stress and an overactive imagination. They were fleeting feelings that would pass. They were emotions in my control, emotions that could be managed by deep breathing and time management skills. I didn’t have to worry, I just needed to get my act together. I started experiencing mental illness symptoms in 2012. At that time, I thought I had enough to reason to brush off the feelings with a simple, “This, too, shall pass”. I was eighteen years old and bridging the cultural gap between high school and college. I was balancing a seventeen-credit schedule with a part time job and commuting forty-five minutes each way to my university four days a week. I was more stressed than I’d ever been, so why shouldn’t I feel sad and nervous and tired and overwhelmed? One question I got this week was: When did you know that something was wrong? I hadn’t thought about mental illness before that moment. I hadn’t considered that maybe what was happening to me wasn’t my fault, but was instead the result of something chemically wrong inside of me. I went to the doctor, an appointment which me forced me to face the reality of my suicidal ideation, a symptom which I had been nervously pushing aside since the thoughts first crept into my head, a symptom which made me terrified of myself. My primary care physician provided me with a prescription to act as a fire extinguisher for my anxiety and negative thoughts and referred me to a psychiatric nurse practitioner, who he felt would be able to give me more adequate care considering the severity of my symptoms at that point and who diagnosed me with major depressive disorder and generalized anxiety disorder. I still see her to this day, and she has been incredible in working with me to find the proper medications to alleviate my symptoms. This brings me to a second question: Did you experience side effects with any medications? Side effects are truly difficult to escape from. When I began my first anti-depressant, I had to take at night to try to sleep through the nausea it caused for the first few weeks of taking it. I also had a sleep aid which worked so well the drowsiness it caused stretched far into my mornings, which made me often skip taking it on nights when I had to work early just to be sure I wouldn’t sleep through my alarm. About a year into being on these medications, I mentioned a return of negative thinking to my nurse practitioner. She added an anti-anxiety medication to my regimen to help counteract these affects, and although this helped for a few months, I found myself in the emergency room with suicidal ideation in 2015. After this, I was switched to another anti-depressant. Although I experienced the same nausea that I did on my first medication, this one has made an incredible difference in alleviating my symptoms, decreasing negative thinking, and overall improving my quality of life. I remain on this medication to this day, though in the last six to twelve months I’ve began decreasing my doses in the hopes to eventually wean off it entirely. I can go more in-depth into my experiences. I can talk for hours about how isolated I felt living with, or who high my anxiety got when I realized my initial therapist wasn’t helping and that I would have to start all over again with someone new. I could tell you about the days I spent fighting to get out of bed, or how it every step forward felt like trudging through molasses. In fact, I’ve written about all of these things in poetry and prose. But for the PLEASE HEAR WHAT I’M NOT SAYING anthology, I wanted to offer hope. I wanted to peel back the shadows and show the light at the end of the tunnel. I wanted to share how opening up about my struggles made me feel empowered, and I hope that this might help others who are suffering feel a little empowered, too. “Concept” is a piece that reflects back on my thoughts during my first turn-around during therapy, the first time in my treatment that I felt like I could get better, and that I felt like this illness could somehow make me a stronger person. First published to my Tumblr page last year, I’m both honored and delighted to have it included in this anthology to benefit the UK-based mental health charity, Mind. PLEASE HEAR WHAT I’M NOT SAYING is set to release on February 8, 2018. Last night, I sat in a half-vegan restaurant with vintage radios mounted to the walls. I ate over-salted barbecue chips and sucked down a bourbon tea trying to find the vanilla flavor my friends swore they tasted. Only minutes before, I stood in front of these very friends and read a selection from the first chapter of my debut novella, Exit Ghost. I signed books and snapped photos and smiled so much my cheeks still hurt. My heart still picks up when I think about standing at that podium and reading eight straight pages of words that I cracked open my own chest to write (figuratively, of course). I spent the whole day prior nervous and scrambling for distractions to calm my brewing anxieties. But I did it. For the second time, I stood in front of family and friends and read my work aloud. For the second time, I let my hand cramp from scribbling inscriptions on title pages of books. For the second time, I saw my dreams unfolding in front of me and, for the second time, I was overwhelmed with awe. I don't think that feeling will ever go away. And as I sat there in that tiny little corner eatery, the tension in my muscles finally uncoiling and my heart finally settling between my ribs again, talking and laughing with friends, I felt like the luckiest person in the world. I'm so relieved and grateful to finally be able to share Exit Ghost with the world. It's a story I've been working on for a full year now. The first in a trilogy, it's also a story that's very close to my heart and one that I have big plans for in the future. It means the world to me to send this book into the literary stratosphere. Thank you so much to everyone who came to celebrate with me last night. The night was made even more special my surprise visits from friends I haven't seen in years, whose excitement raised mine even higher, and whose support I'm so thankful to have. Thank you to the team at the Book Revue, especially to Loren and Genesis, whose hard work made the night run so smoothly and perfectly. Thank you to everyone who has supported me and helped bring me to this point. I couldn't be grateful. 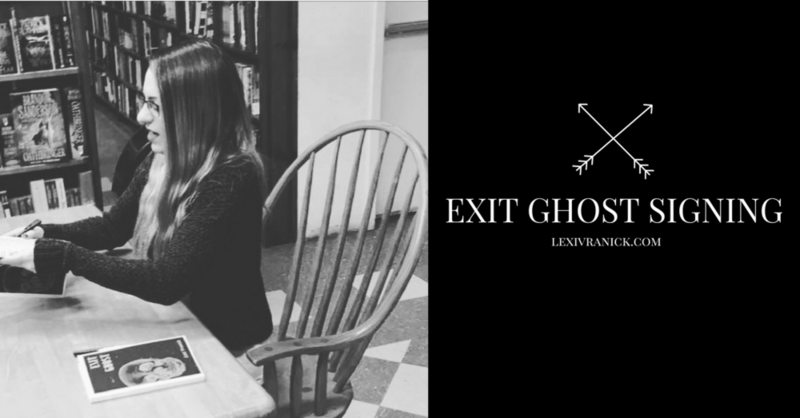 For those unable to attend last night's signing, signed copies of Exit Ghost are now available at lexivranick.com/shop! Please note that at this time signed books ship within the United States only. The book is available internationally on Amazon.